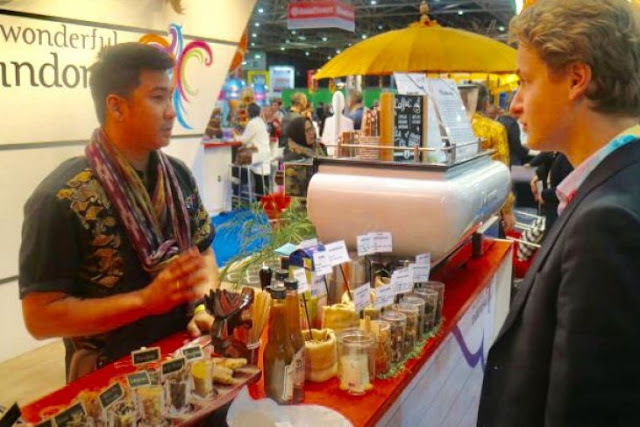 Coffee and traditional Indonesian drinks -- wedang ginger, sour turmeric, and jakencruk -- formulated by mixology at Spain's biggest tourism exhibition, Feria Internacional de Turismo (FEATURE) Madrid 2019 drew visitors at Feria de Madrid. On the first day of the exhibition, held on Jan 23-27, the Wedang Ginger dish received coverage from local television 101, and they were happy and interested in the beverage that was enjoyed the visitors, Mixologist Erwin Perdana Warman informed Antara on Saturday. It is said that in addition to tahlil coffee, which was favored by visitors, many inquired about where to find such drinks, both in Madrid and Indonesia. Erwin, an expert in concocting or mixing traditional drinks, catered to numerous visitors at the Indonesian pavilion featuring a Phinisi to beckon visitors and speak about the visit to Indonesia and be eager to go back to enjoying a typical Indonesian drink. Tourism Minister Arif Yahya led the Wonderful Indonesia group directly in the third-largest exhibition after ITB Berlin and WTM London where Indonesia had also promoted traditional coffee and drinks. According to the minister, Indonesian coffee is most sought after by visitors at tourism exhibitions. He revealed that Indonesia was always requested to present a coffee booth at major exhibitions that always attracted visitors at the exhibition. Indonesian coffee, presented at the Indonesian pavilion, has a distinctive taste and is specially formulated by a coffee maker called Barista, Deryl Juniar from the Solo Coffee Roastery said. Juniar was flattered by the enthusiasm shown for coffee tasting by visitors. Some visitors also gave Juniar some tips, as they claimed to have never tasted such good coffee in Madrid. Juniar brought along 25 kilograms of coffee to be served for free to visitors at the Indonesian pavilion. Juniar said their mission is to introduce Indonesia through a cup of coffee and traditional Indonesian drinks. In addition to traditional coffee and drinks, the Indonesian pavilion promoted the use of henna, delivered by Muhammad Ariefa Akbar, for which several visitors are willing to stand in line daily. "I am very happy to be able to participate directly to help promote Indonesian tourism activities in Madrid," Akbar noted. He admitted that enthusiastic visitors were willing to queue up for hours and even before the opening, there was someone inquiring for henna. The henna used by Akbar is quite different, with the addition of white henna, glitter, and beads, thereby making the appearance of henna unique and attractive. The Indonesian Pavilion, always thronged by visitors, also displayed Indonesian art in the form of dances performed by professional dancers, such as Melly Zamri, known as Putri Malam along with Rita Daryuni. "I am happy and proud to be trusted by the Ministry of Tourism to display a very rich Indonesian budah," Zamri remarked.